For a person with such wanderlust and a propensity for impulsivity, I find it awfully hard to feel at home in new places. When I was taking short trips that didn't take me away from the comforts of home for more than a week or two, this wasn't that big of a deal. I thrived on the scarcity of time that I had to enjoy and explore that new place and didn't get caught up on whatever I was missing. But once you have to face your first month away from home, the challenges of being away become a lot more real. Your situation feels a lot less temporary and a lot more long-term. Sometimes even inescapable. I've incrementally warmed myself up to spending long periods of time away from home. My first experience was when I decided to spend a few weeks at a sleep-away summer camp when I was sixteen. The camp lasted three weeks, which seems like a trivial amount of time looking back, and I remember finding the first week extremely overwhelming and feeling homesick a lot. But I quickly settled in and made the friends that you're forced to make when you share a humid cabin with twenty other people. By the end of the three weeks, I couldn't even imagine leaving because that humid little cabin had started to feel like home. After that, I felt ready to take on the next step. The next step, however, was college. Shipping yourself off to a brand new city for a semester is a lot different than three weeks at a summer camp. You need to learn how to become your own person, independent of your parents or any camp counselors who will remind you to eat and signal when it's time to go to bed and do your laundry. Because I was at my dream school and had an amazing first year roommate, I didn't find the adjustment that difficult. It helped that everybody was in the same boat, so we all found comfort in each others discomforts. It did take a while for my tiny dorm room to feel like a home, but it eventually did as everything else in my life fell into place as the semester progressed. The third challenge I faced was when I studied abroad in Spain for a little more than a month the summer after my freshman year. It was my first time traveling abroad by myself. Well, I wasn't completely by myself - I was with a group of thirty other students from my university. A far cry from being along. But still, there was a certain level of independence that came with that experience - I had to live on my own with a host family that didn't speak English and navigate my way to school without a GPS on my phone because it took a few days to get an international SIM card. I was definitely out of my comfort zone and definitely felt that knot in my stomach that told me I was homesick. But much like at summer camp, after the first week I started to feel at home in my beautiful little Spanish community. But none of those three experiences could have possibly prepared me for this - spending five months abroad on the opposite side of the world. I know that I've mentioned in numerous former blog posts that my first few days (weeks even) in Australia were hard for me. Once the semester started and I'd formed a solid group of friends, however, I started to feel more at ease. Even though I'd started forming daily routines and making long term commitments, there was still a part of me that felt like one little mishap could send me packing and on the next flight home to New York. That feeling settled about a week ago - two full months into my total study abroad time. That's a long time to feel on edge. Upon reflection on all four of my "home-away-from-home" experiences, I've realized a string of milestones that I need to achieve in order to truly feel like I've made a new place into a home. Some of these may seem trivial or might not make a ton of sense, but they're actually very important components of my daily life. Like finding a coffee shop where I can spend the afternoon studying with decent wifi and consistently good coffee. Or finding that place where I can go for a run or a walk and feel totally at peace and connected to nature. Having that moment when I realized that I could get most places without plugging it into Google Maps first. These are all things that I took for granted at home, but I'm now realizing how much I appreciate those little things. Because I'm a horrible subscriber to American consumerism, my go-to coffee shop here is the closest Starbucks. Yes, I intentionally walk twenty minutes to Starbucks instead of going to one of the thirty small coffee shops that are within a stone's throw of my apartment. I won't deny that I have a special place in my heart for American caffeine giants, Starbucks and Dunkin Donuts. In Boston, I found quite a few local coffee shops that I prefer and I really tried to do that here as well. But Starbucks, with it's comfortable lounge chairs, sweet vanilla lattes and view of the busy Sydney streets, just happens to be the place where my caffeine addiction feels the most at home. I'll go there after class or on the weekend, order my drink of choice and spend hours doing my assignments (or procrastinating on my assignments). The baristas are friendly (and spell my name right almost every time), the drinks are good, the toasted banana bread is amazing and I feel good when I'm there. What more can I really ask for? Even more important than finding my go-to coffee shop was finding a place where I could take a walk or a run. I rely on my walks and runs as an opportunity to clear my head, cleanse my conscience and feel rejuvenated for the next couple of days. At home, I go down to Robert Moses State Park and run alongside the ocean on a mostly abandoned stretch of beach. In Boston, I make my way to the Charles River Esplanade and find joy in all of the young families walking their perfect dogs and pushing their perfect children in strollers. 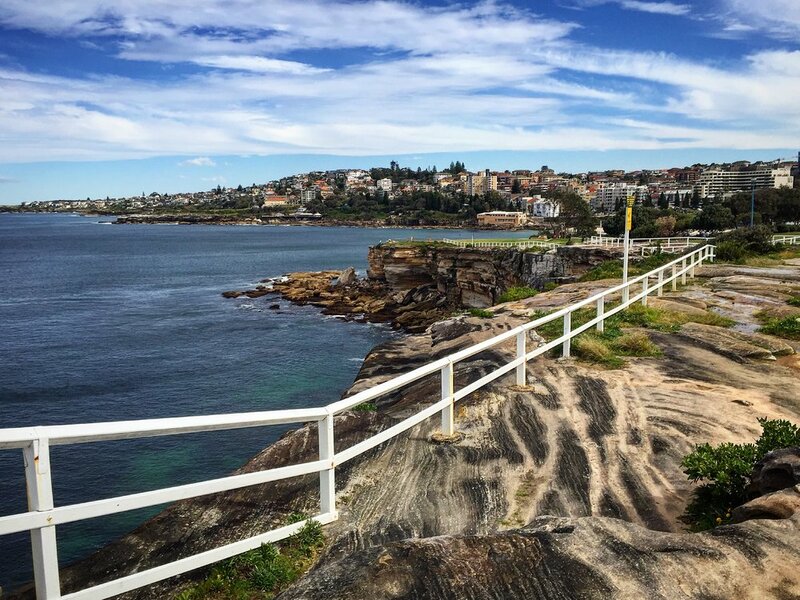 And now in Sydney I travel forty minutes, taking one train and one bus, to end up at Bondi Beach, where I complete the Bondi to Coogee Coastal Walk. The first time I ran this trail was right after my last midterm and I was stressed out of my mind from weeks of studying, defeat and extreme lack of time outdoors and fresh air. It was a beautiful Saturday morning and the trail was packed with people, but I started running and didn't stop until I'd finished the full twelve kilometers and was right back where I started (minus the stress). The views were breathtaking and the hundreds of steps and uphill climbs along the way literally took my breath away. I fell so in love with that walk, though, that I've been back two more times in the week since. I knew I'd found my place. There are a few other things that have helped me better adjust to life in Sydney. I've been attending weekly workout classes and found instructors that I really like going to (and workout playlists that I like even more). I found a restaurant, Salmon & Bear, that I can't imagine not eating at one more time before I leave. I've made a list of places I still have to go to and things I still have to experience, like walking the Harbour Bridge, hiking the Blue Mountains, hugging a koala and surfing at Bondi Beach. Realistically, this list extends with several lifetimes worth of things to do and see. Honestly, I'm starting to wish I had more time. I'm getting to the point where I can foresee how hard it is actually going to be to leave this place. I've finally started to feel settled and I'm already more than halfway done with this whole journey. I remember being on the plane here and writing about the Caulifower Clouds over the Rocky Mountains, not even being 1% of the way in and feeling overwhelmed by what was yet to come. Time has truly flown, although at some times it really didn't feel like it. I've learned that it's extremely important to find norms like coffee shops and walking trails, but also to find new experiences to look forward to. This combination gave me the momentum to carry on and feel good about being away from home for so long. I know that I'll leave in November feeling fulfilled and like I truly do have a home-away-from-home that I can return to and reminisce about the experiences I had when I was twenty years old. And now I have the insight and tools to feel at home more quickly in whatever foreign land I find myself in next.